Before you can open the Ice Cream Stand portion of your shop, you need to purchase a cow. The basic dairy cow can be bought for 1200 G at the Animal Shop. When a customer orders an ice cream, he or she will tell you what kind and its shape. Once you add more attachments from the Tool Shop to your Ice Cream Stand, the customer will also tell you how many toppings he/she wants. 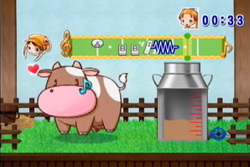 During the rhythm game, your task is to repeat the button sequence that the cow selects. As the meter moves across the bar, Wii buttons will appear at certain beats. If you see a Wii remote "squiggle", the cow wants you to wave your Wii remote at that point when it's your turn. After the cow selects its beats, then you have to repeat it. Press the A, B, or do the remote "squiggle" at the right spots. If you get all of them right, then your milk container will fill up. You'll repeat this mini game until your container is completely full. It will only take three runs of repeating the cow's beats to fill up the container. If you mess up while you're trying to match the cow's rhythm, then the container will not fill up as much and you'll have to play with the cow for another round. More rounds take more time, and you'll earn less of a bonus score. The Milk Smoother can be purchased at the Tool Shop for 2000 G. You will need to buy it if you want the Sharp Eye bonus. 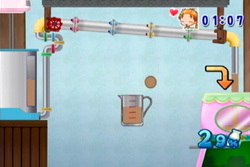 As the milk is mixed on the left-side, it pushes through a pipe to the other side. Unfortunately, some of it will drip out of the four joints in the pipe. You are to collect the drops of milk in your cup, and then dump the contents into the bucket on the right-side. Your cup can only hold 5 drops of milk in it. Once you reach 5, make sure you move your cup over to the bucked and press A to pour it out. If a 6th drop falls into your cup, then it will overflow and you'll loose 3 drops. The cup can be emptied at any time. You do not have to wait for your cup to fill before dumping it out. It is a good idea to try and have an empty cup as much as possible, since the milk will drip faster as the mini game progresses. If you have an empty cup, you're catch more drops and not overfill. This one seems to cause a lot of people some trouble. The idea is you are suppose to move the Wii remote in a wide circle out in front of you, but it doesn't seem to always line up correctly. If you move too fast, then you will mess up the shape of your ice cream. If you move too slow, then you end up with an unstable cone. It may help to keep an eye on what side of the ice cream cone is being filled. 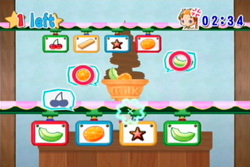 If the ice cream is pouring into the left-side of the cone, try to have your Wii remote in-front and to-the-left of you. If it is on the right side, then move to the right. When an ice cream cone becomes off-center, the machine will stop dispensing and an obnoxious alert will appear in the upper-left corner. 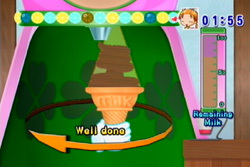 To stabilize your tower of cream, tilt your vertical Wii remote in the opposite direction that the ice cream is leaning. There will also be a helpful arrow pointing in the direction you need to lean. If your ice cream topples over, then you have to start swirling it around from the beginning. As long as you still have remaining milk to make ice cream with, you can try over and over if you keep dumping your cone over. On the other hand, the longer you take to shape the ice cream, the angrier your customer will be. The Topping Machine can be bought for 4000 G at the Tool Shop. Last, your customer will ask you for up to 5 toppings. A shadow of the requested topping will appear in front of you, and then the available choices will glide out from the sides like a shooting gallery. Simply press A on the square that matches the shape of the shadow to move onto the next topping. You will shoot at a cherry, melon slice, orange slice, starfruit, and wafer cookie. The toppings are not unique; you may be selecting cherries a few different times in the same order. If a topping escapes off to the side before you can shoot at it, then you will not get the mini game points! You have to shoot the requested number of toppings. The rotten thing is you won't get the full 800 points unless your customer requested 5 toppings. If your customer only wanted 4, the most you can get is 640 points. If he or she wants 3 toppings, then you'll get 480 points. You will earn an extra 800 points if your customer orders ice cream made with strawberry milk. You will need to of purchased the Ice Cream Set add-on for this to become available.